If you want all of your kids to practice facts at the same time–without having to wait a long time for their next turn–try this version of Don’t Eat Pete. For this version of the game, my kids chose to play with real pennies. They got to keep the pennies they earned, and we did some math with the pennies after we finished playing. Bear, age 10 and to your left, is using the ÷12 game board. Boo, age 6 and to your right, is using the ×2 game board. My kids really like to play this way, and they reviewed a lot more in a shorter period of time than they usually do. At the end of the game, the kids lined their pennies up in rows of 10 and counted them. Because we pay 10% of our income to our church, the girls took one penny from each pile to save for tithing. Finally, the exchanged their pennies for quarters, dimes and nickels. 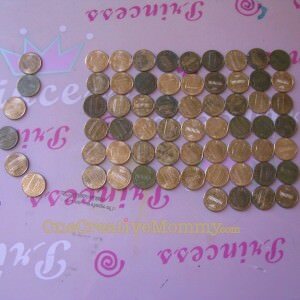 (It took some explaining to get Lu to trade her pile of pennies for only a few coins. It was a good lesson for her on the value of different coins. Let me know if this idea works for you! If you have any other ideas of how to play, please share a comment. Thanks! For instructions on the original game, check out this post. To see my digital downloads for Don’t Eat Pete, please visit My Shop at TeachersNotebook.com.